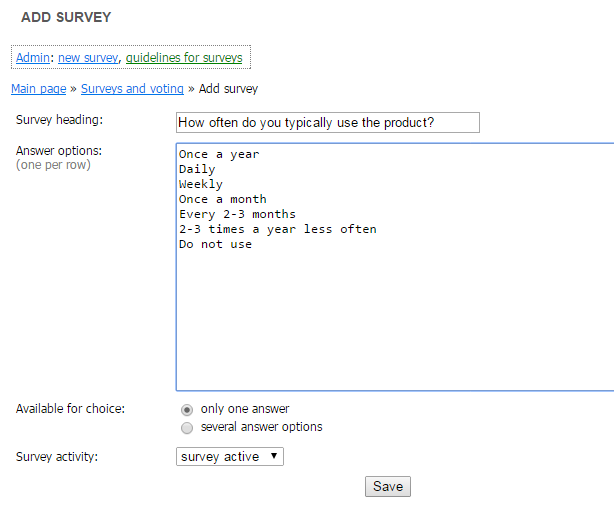 To create a survey, go to the "Content" - "Surveys and polls" page in your website's management system. You will be redirected to the survey creating form. 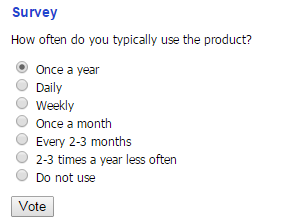 Name your survey by filling in the "Survey heading" field. 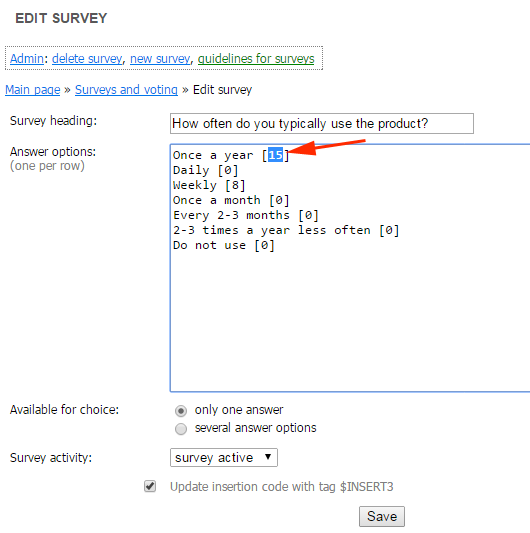 Write the survey answer options, which will be available for site visitors, in the "Answer options" field. Attention! Each answer has to begin with a new line. After filling the fields, click the "Save" button. You have created a survey that you can edit when needed. You can manage the surveys on your website, see each survey's code insertion, change and remove survey data in the survey overview page: "Content" – "Surveys and polls". To add new fields to the survey, click "Content" - "Surveys and polls" - "Edit". To add new answer options, write them in the "Answer options" field. Each answer option must begin with a new line. Click the "Save" button. To change the survey or poll results, go to the "Content" - "Surveys and polls" - "Edit". The number of votes for each answer option is displayed in the end of each answer option in the square brackets. As shown in the example above, you can change the number in the square brackets, and the survey/poll results will change accordingly. Click the "Save" button. For each survey, system assigns a "Code insertion". To display the survey in the desired page of your website, write the assigned code insertion into the page code or create a hyperlink to the survey. Code insertions that are assigned for each survey are displayed in the management system page "Content" - "Surveys and polls". Example: Let's add a survey under the menu on the left side. the page that displays all surveys and polls: "Content" - "Surveys and polls"
Select the code insertion for the desired survey. In the visual editor, write in the code insertion. You can use the "Shift+Insert" buttons on your keyboard to paste the code insertion from the computer memory, or you can write in the code insertion manually. Click the "Save" button. The survey will appear on the edited page.